18 Breast Cancer Awareness 2015 2B Thinnagain Weight Loss We offer Rx Medications 1300 25th Street Cleveland, TN 37311 423-479-4389 2B 2B Th Thi hin inn nnaga gai e offer R We (Includes visit and medication) Phentermine in in Weig igh ght ht Lo Loss e offer Rx Medications (Includes visit and medication) e $50 per month 1 3731 Cleveland, TN 1300 25th Street Medically Supervised P ery Saturday 10am til 2pm Ev uesday and Tu ery Open Ev No Appointment Phentermine - 37.5 Fastin - 37.5 Adipex - 37.5 1 f on Stafff A ervised PPA ery Saturday 10am til 2pm Thursday 10am til 5:30pm uesday and Necessary No Appointment B-12 Injections Myoden Injections HCG Injections 423-479-4389 423-479-4389 Thursday 10am til 5:30pm 9 054000199658 KNOWLEDGE IS POWER! 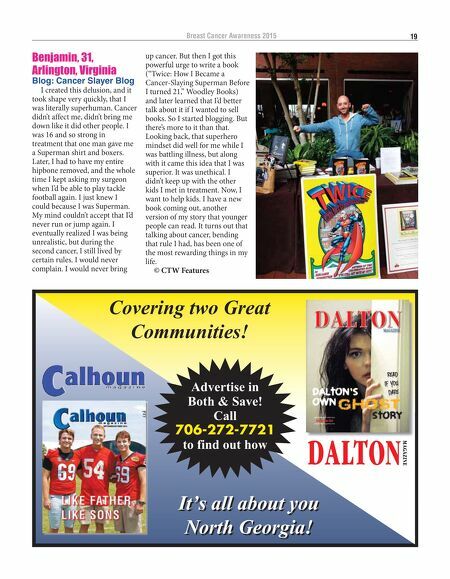 Subscribe To THE DAILY CITIZEN! PLUG IN TO THE POWER SOURCE! whereas our cancer has already come back. The most common question people ask is, 'How can you manage to live when you know you're going to die?' I'd learned I had end-stage cancer, and I had accepted it. I only wanted to make it to my youngest son's graduation, which I did. But then a new drug (Perjeta) came out and put me in remission. In my wildest dreams I didn't think I'd still be here. I'm making plans again. I'm planning a vacation. I'm thinking about buying a car. I'm shopping for dresses for my son's wedding next year. I know in my mind that I could get sick again but I'm not going to live that way. Now that I'm better, I feel like I've missed all these years and I'm trying to figure out what to do. Some things, like travel, are very hard on me. The blog has been helpful because it gives me something meaningful to do. 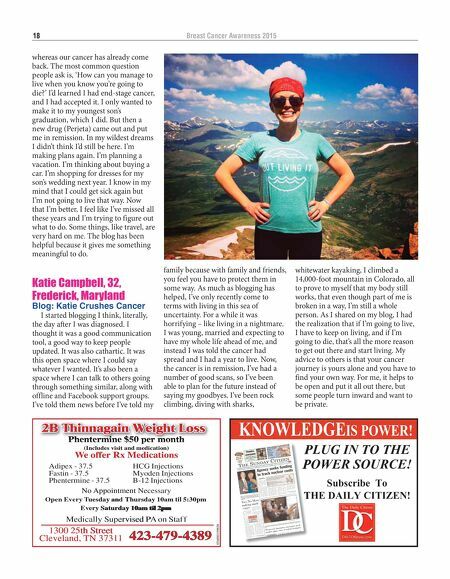 Katie Campbell, 32, Frederick, Maryland Blog: Katie Crushes Cancer I started blogging I think, literally, the day after I was diagnosed. I thought it was a good communication tool, a good way to keep people updated. It was also cathartic. It was this open space where I could say whatever I wanted. It's also been a space where I can talk to others going through something similar, along with offline and Facebook support groups. I've told them news before I've told my family because with family and friends, you feel you have to protect them in some way. As much as blogging has helped, I've only recently come to terms with living in this sea of uncertainty. For a while it was horrifying – like living in a nightmare. I was young, married and expecting to have my whole life ahead of me, and instead I was told the cancer had spread and I had a year to live. Now, the cancer is in remission, I've had a number of good scans, so I've been able to plan for the future instead of saying my goodbyes. I've been rock climbing, diving with sharks, whitewater kayaking, I climbed a 14,000-foot mountain in Colorado, all to prove to myself that my body still works, that even though part of me is broken in a way, I'm still a whole person. As I shared on my blog, I had the realization that if I'm going to live, I have to keep on living, and if I'm going to die, that's all the more reason to get out there and start living. My advice to others is that your cancer journey is yours alone and you have to find your own way. For me, it helps to be open and put it all out there, but some people turn inward and want to be private.